Forging(Hada): Forging is conspicuous Itame-hada with indication of entwined flowing mark of Masame along quenching side. The entire Hiraji surface is covered in Ji-nie that generates black gleaming lines of Chikei over the surface. Temper(Hamon): Hamon is a bit on stronger side Nie hard metal granules base, shallow undulating NOTARE that consists of small Gunome, Togari-ha or box-shape pattern where works with rather on stronger side of sparkling Nie and filled with foggy Nioi. The interior of temper works with thick Ashi toward the cutting edge and thick gleaming lines Kinsen and short streaming lines of Sunagashi crystalline area. Temper of tip(Boshi): Boshi forms irregular Midarekomi, medium circle turns back in general. Tang(Nakago): Nakago shape is Ship-bottom Funazoko shape in UBU original. Three peg retaining holes (Two is filled). Shallow Katte-sagari (slightly slanting left) filemarks. Back ridge of Nakago is flat to show greatly slanting left (Ō-sujikai) filemarks. The Nakago is relatively short for it's cutting edge, Single bevelled heel shape Kata-yamagata. The sublime stroke of inscription signature is located upper the Shinogi-ji in front FUYUHIRO-saku 冬廣作. FUYUHIRO 冬廣, said a son of 3rd generation Sōshu-HIROTSUGU 相州廣次 who had lived in Sōshu province (current Kamakura city) went to live in Obama, Wakasa (current Fukui pref.) to establish FUYUHIRO lineage in Kansho era (1460-). FUYUHIRO lineage enjoyed the confidence from generals and worked in Hōki or Bizen, Bingo or Izumo as well to meet with increasing demand. During the Warning State period, FUYUHIRO 冬廣 who belonged to Sōshu school had come into constant relationship with raised lineages of Bizen or Mino school like this example and met with increasing demand. FUYUHIRO family tree had been prospered to NAGANOBU 長信 of the 17th generation FUYUHIORO until end of Edo period. This katana forms typical Kencho-shinto style that reminds us　the scenery of Soshu provenance from Nanbokucho period and being ardently admired by pedigree SHIZU work. Itame-hada forging technique with a rather on stronger side quenching Hamon, both shows resemblance of Sōshu-technique holding full of stirring Samurai spirits. 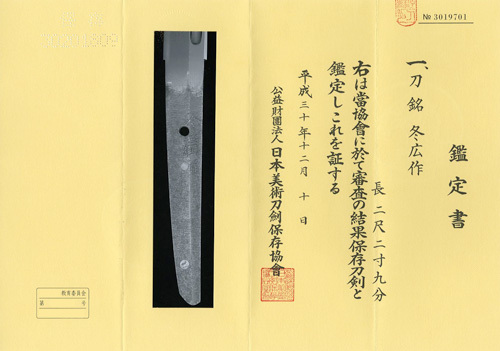 From it's unique and sublime stroke manner of inscription signature (the last character of "saku" is intentionally small), this katana was made by Tou' Saemon-no-jo FUYUHIRO 藤佐衛門尉冬廣 who was active from Eiroku era (1558-).